Are you looking to rent medium generators? Look no further. We work with East Coast Generators to provide reliable medium sized generators to customers across Melbourne. Our large range of hire generators are available to rent 24 hours, 7 days a week. For last minute power or a planned event, hire a generator from our high-quality range. We host a range of medium generators, from 100 to 250kVA, we have the right sized generator to suit your project. All of our medium generator units are contained in acoustically silenced canopies to ensure disruption to your event is minimised. Avoid sound pollution and hire one of our functional medium sized generators. Medium sized generators are great for events (weddings, festivals, pop-up restaurants etc. ), construction sites, power outages, and a range of other applications. Our medium generator rental services are perfect for those who need more power than a small generator but still need something that is easy to transport. 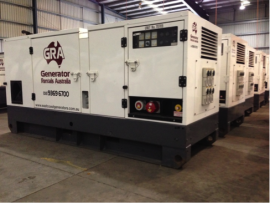 At Generator Rentals Australia, we provide power for any purpose. Whether it be events, construction, or emergency situations where the mains power supply has been cut. All of our medium generator hire units have inbuilt fuel tanks to allow at least a 12 hour run time and most have the fuel capacity to run for 24 hours. For extended run times, we can connect up remote fuel tanks to our medium sized generators. This can allow the units to run for up to a week without interruption. We can make sure the fuel tank is supplied during the initial hire to minimise disruptions to your power supply and reduce cost. Medium generator rental is perfect for people who only require temporary portable power. You can save costs by hiring a solution instead of making an unnecessary purchase. Borrowing gear from your mates can be really unreliable. When you hire from GRA, you’ll always get reliable backup power. If you encounter any unexpected problems, all you have to do is get in touch with our team and we’ll sort everything out. Contact us to rent medium generator Melbourne and surrounding areas. Our comprehensive range of generators is available at all hours to help you power any occasion. If you think you might need a smaller option, or if you’re looking for something with a bit more power, take a look at our large and small generator hire pages. At Generator Rentals Australia, we have all your portable power needs covered. Thinking about buying a medium sized generator? Take a look at our range of East Coast Generators for sale. We have new and used models that will bring power to your project. If you have any questions about our range, you can find out more about our services or request to rent medium generators by calling is on (03)9369 6700 or emailing us at enquiries@eastcoastgenerators.com.au .